Ever dreamed of seeing the USA as it was meant to be seen - on a motorcycle? 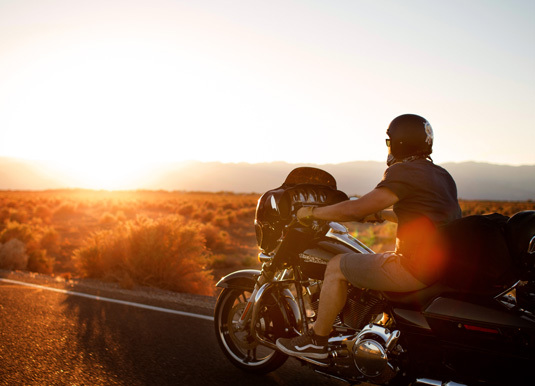 Whether you’re looking to blaze the trails on your own, or experience the open roads of America with a group of fellow biker enthusiasts, EagleRider has the perfect guided or self-drive motorcycle tour ready to take you there. EagleRider are the world’s largest motorcycle tourism company providing a huge variety of beautifully maintained Harley-Davidson, Indian, Triumph, BMW and Honda motorcyles as well as all kinds of ATVs, Dirt Bikes and Scooters to accommodate any motorcycle rental or tour experience. The rental process at EagleRider is very smooth. After showing your valid motorcycle driver’s licence and credit card you’ll be taken to your motorcycle for a full orientation of the bike’s functions and unique features. Helmets are included with all rentals and all bikes come equipped with saddle bags and windscreens. EagleRider also offers free luggage storage. After your orientation is complete, you will be ready to hit the open road on the bike of your dreams. An EagleRider guided tour is the most complete package for travelers, where every single aspect of the trip is taken care of. Groups of riders travel together with a professional bi-lingual guide a support chase van with spare motorcycles. Self-drive packages include a late model motorcycle, first-rate hotel accommodations, a detailed day-by-day itinerary with lots of useful tips, and transfers between hotel and EagleRider location. Routes have been meticulously planned and take you along the most scenic and attractive roads in the area.